For Angelica, it is essential to provide the highest level of clean. The level of clean adopted by 95% of healthcare laundries – “hygienically clean” – is hard to quantify and is the lowest level recognized as acceptable for healthcare facilities. As the industry leader, we recognized the need to meet the challenge head on, by moving beyond hygienically clean to a disinfected cleaning level. Utilizing a peracetic acid based product called Advacare®*, the first and only EPA registered porous surface laundry disinfectant, we became the first healthcare laundry to transition to sanitized and then to a new standard of clean. We call the result AngelClean®. AngelClean® is the cleanest non-sterilized linen in the industry. In fact, after the wash process, a minimum of 6 log reduction in microbes is achieved, making Angelica’s linen at least 100,000,000 times cleaner than the industry standard. We understand, treat, and oversee the environmental variables that have an impact on linen cleanliness. Understanding local environmental conditions plays a significant role in the overall process. To disinfect, you must understand how the additives interact with the elements found in the local environment, adjust the levels, and apply them at the appropriate time in the process. This can vary by plant. Rigorous testing enables us to determine the right formula and when to add the additives, while continuous monitoring insures consistency in processing. Identifying opportunities to minimize the impact we have on the environment is important to Angelica. We invest in the most efficient technology because it helps reduce the use of critical natural resources and produces less waste. 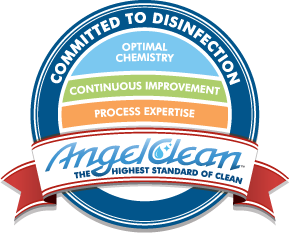 We invest more on the AngelClean® process because it provides a quantifiable level of clean for infection prevention and patient safety. We make these investments because it is simply the right thing to do. 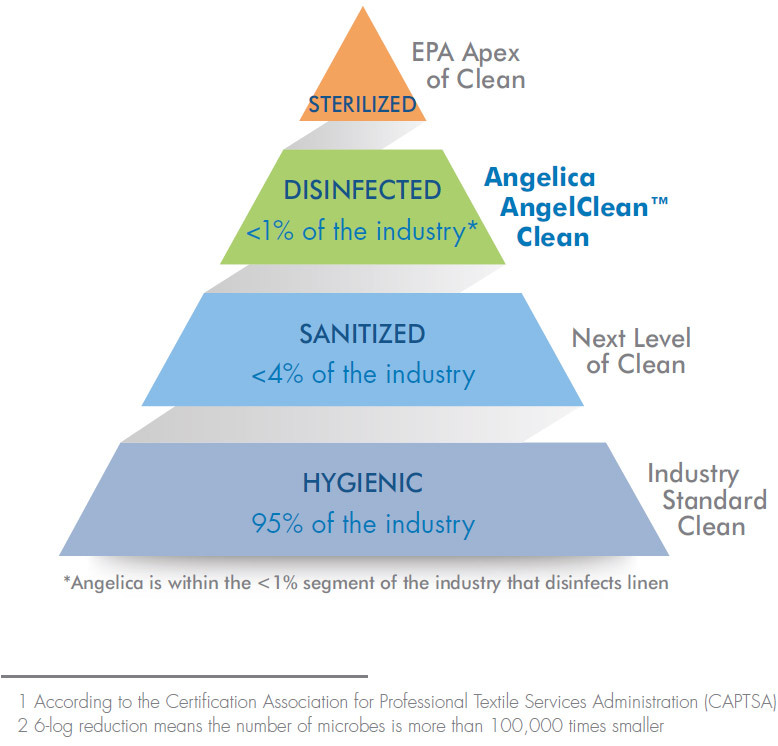 At Angelica, we achieve a minimum of 6-log reduction in microbes because of our expertise in disinfecting healthcare textiles during the wash process. The result is AngelClean®– linen that is at least 100,000 times cleaner than the current industry standard. This chart illustrates the impact log reductions have on a test area harboring 100 microbes. 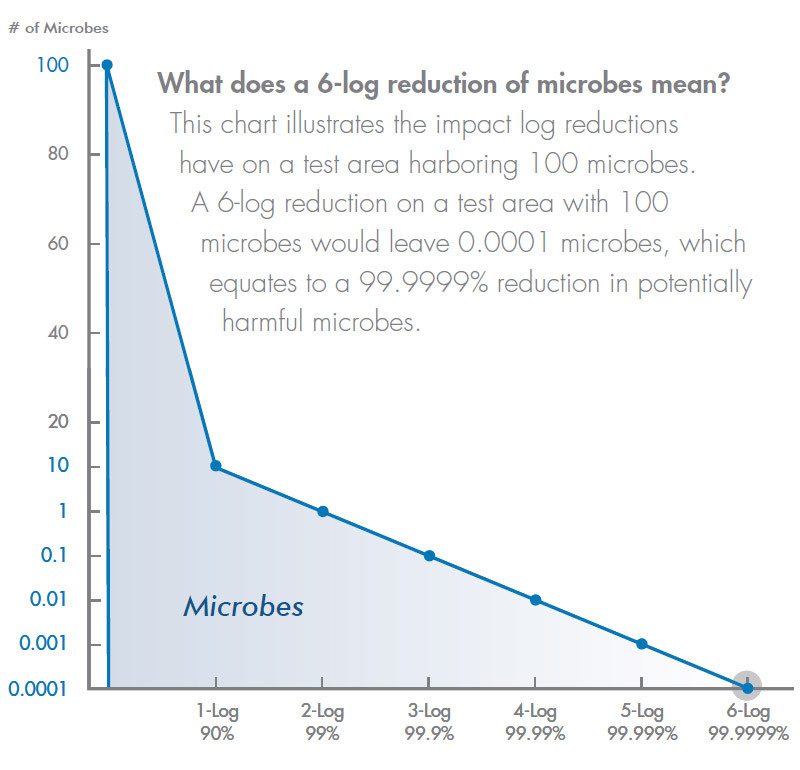 A 6-log reduction on a test area with 100 microbes would leave 0.001 microbes, which equates to a 99.999% reduction in potentially harmful microbes. “Log” stands for logarithm, which is the exponent of 10. For example, Log-2 represents 102 or 10×10 or 100. Log Reduction stands for a 10-fold (one decimal) or 90% reduction in the number of microbes. Another way to look at it is: 1-Log Reduction would reduce the number of microbes 90%. This means, for example, that 100 microbes would be reduced to 10, or 10 reduced to 1. 1-Log Reduction (Log1): Number of germs is 10 times smaller. 2-Log Reduction (Log2): Number of germs is 100 times smaller. 3-Log Reduction (Log3): Number of germs is 1,000 times smaller. 4-Log Reduction (Log4): Number of germs is 10,000 times smaller. 5-Log Reduction (Log5): Number of germs is 100,000 times smaller. 6-Log Reduction (Log6): Number of germs is 100,000,000 times smaller.